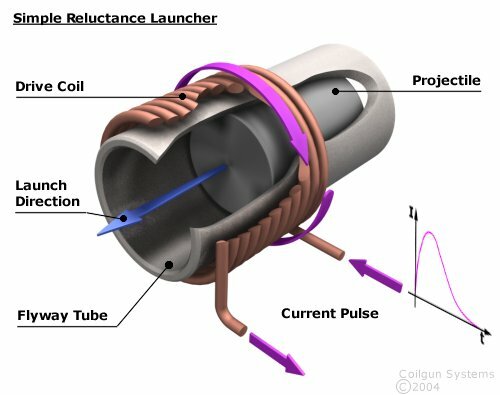 A reluctance coilgun is basically a solenoid which can launch iron or steel projectiles by careful timing of the coil current. The cutaway diagram below shows the very simplest of coilgun designs. While coilguns don't have any industrial application at present, there have been suggestions that these systems could be used to launch payloads into orbit. This is an attractive proposition but there are numerous technical challenges which need to be resolved before it could be considered a feasible project. A more realistic application may be launch boosting where a vehicle is given an initial speed from a long coilgun accelerator. After leaving the coilgun the vehicle would fire its rockets to achieve orbit. Launch boosting could result in significant savings in fuel costs. From a military point of view coilgun technology may have a place in future combat vehicles where, for example, it could form part of a so-called 'active electromagnetic armour' system. Hyper-velocity launching still remains the domain of the railgun, where there is great deal of ongoing research . It may surprise you to learn that the coilgun is nothing new. A pioneer of this particular type electromagnetic accelerator was the Norwegian scientist Kristian Olaf Birkeland . There are two distinct types of coilgun. The first is the reluctance(1) coilgun which uses the attractive ferromagnetic properties of the projectile to generate an acceleration. The second type is the induction coilgun in which the accelerating force is repulsive and comes from the eddy currents induced in the projectile when the coil is 'fired'. This site focuses mainly on the reluctance coilgun although future updates will look more closely at the induction version. For an overview of the beginnings of electric gun research see . (1) The use of a non-conducting tube is preferred because with a conducting tube there is a large electromagnetic braking effect as the magnetised projectile moves through it. Slotting of the tube can help with reducing eddy current braking if a conducting tube must be used. (2) It is termed a reluctance coilgun because the force acts to move the projectile in the direction of decreasing magnetic reluctance. E. A. Mendrela and Z. J. Pudlowski, "Transients and Dynamics in a Reluctance Self-Oscillating Motor", IEEE Transactions on Energy Conversion, VOL. 7, NO. 1, March 1992. B. N. Turman, "Coilgun Launcher for Nanosatellites", The Second International Conference on Integrated Micro/Nanotechnology for Space Applications, April 1999. Richard A. Marshall "Railgunnery: Where Have We Been? Where Are We Going? ", IEEE Transactions on Magnetics, VOL. 37, NO. 1, January 2001. Alv Egeland, "Birkeland's Electromagnetic Gun: A Historical Overview", IEEE Transactions on Plasma Science, VOL. 17, NO. 2, April 1989. Ian R McNab, "Early Electric Gun Research", IEEE Transactions on Magnetics, VOL. 35, NO. 1, January 1999.